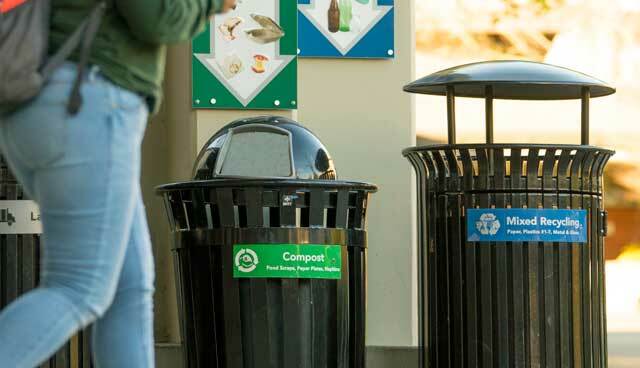 A new California State University system policy establishes purchasing practices aimed at eliminating disposable plastic items while giving preference to reusable, compostable or recyclable products instead. HSU helped guide the way. By 2023, the California State University’s 23 campuses will be eliminating the use and sale of all single-use plastics including plastic straws, water bottles, and bags. A new system policy enacted in December establishes purchasing practices aimed at eliminating disposable plastic items—which make up a significant proportion of the waste campuses send to landfills—while giving preference to reusable, compostable or recyclable products instead. According to the policy, all CSU campuses must eliminate plastic straws and carryout bags beginning in 2019. In addition, campuses must phase out Styrofoam food service items by January 2021 and discontinue sales and distribution of single-use plastic water bottles before January 2023. The plan expands upon the Board of Trustees’ Policy on Sustainability by making sustainability central to the CSU’s business processes. The momentary utility and convenience of single-use plastics like straws, takeout containers and water bottles comes with a big price. These items are not biodegradable or take hundreds of years to decompose. In addition, single-use plastics frequently do not make it to landfills or recycling plants. According to Earth Day Network, 32 percent of the 78 million tons of plastic packaging produced annually is left to flow into our oceans. Much of it ends up in the “Great Pacific Garbage Patch” located between Hawaii and California, which is the largest accumulation of ocean plastic in the world. A number of CSU campuses have already eliminated the use of disposable plastics. For example, Humboldt State stopped selling water bottles in 2012, becoming the first public university in California to do so. Others are working to meet the goal dates outlined in the policy by preparing alternatives including reusable/compostable meal containers, beverage containers and straws. Campus procurement, dining and waste management staff are also working together to fit the new products in with waste processing capabilities. The new policy aligns the CSU with existing California state laws including AB-1884, SB-270 and SB-1335. The CSU is on the cutting edge of discovering and developing new ways to cut emissions, increase energy and resource efficiencies, protect wildlife and secure the environment for future generations. Learn more about the CSU’s Commitment to Sustainability.